From 1980 to the present : Almost 35 years of history and it's not over yet! 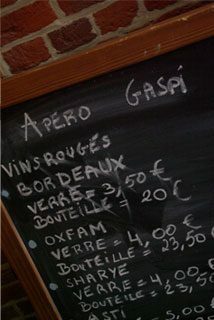 The first bistro-resto « Le Gaspi » opened its doors in 1980 at the top of the Avenue Louis Bertrand in Schaerbeek. The name referred to the anti-wastage ecological movement of the 70s (Petrol crisis, nuclear danger, waste of resources). It rapidly became one of the fashionable cafés of Schaerbeek along with “Le Jugement Dernier” and “L’Ultieme Hallucinatie”. Le Gaspi was the meeting place of a generation of intellectuals, journalists and political personalities of the 80s. The artistes of the Théâtre 140, the Halles of Schaerbeek and the Botanique met there often. It was also the meeting place of all kinds of militants (pacifists, third-worlders, anti-racists…). It is also remembered as the refuge of demonstrators during the dramatic night that followed after the meeting of Nols with Le Pen in Schaerbeek. Its reputation is also built on a ‘cuisine termed Nouvelle’ at the time, such as vegetable tarts, wholemeal, organic desserts. The Gaspi was also one of the first cafes to offer about a hundred different beers. It was also one of the first to serve the Blanche de Hoegaarden from the barrel! The Gaspi enjoyed continued success for 16 years. In 1996, the bistrot was sold and, in 1998, fire put an end to the adventure. After 14 years of closure, the bistrot, renamed « Bar du Gaspi » was reborn from its ashes. A site of culinary, cultural and festive discoveries: homemade cooking, presented in the form of « Gaspas » (vegetarian or not), a renowned choice of Belgian and artisan beers as well as a multitude of artistic events, (exhibitions, concerts) and entertainment (quizzes, karaoke, tastings, DJ evenings, football on wide screen, etc.) We’re waiting for you to write the rest of its history!